Today, November 27th, 2012, has been designated a national day of mourning in Bangladesh. On November 25, 2012 fire swept through the Tazreen Fashion factory, a garment factory on the outskirts of Dhaka, Bangladesh’s capital, killing more than 120 people in the country’s worst-ever factory fire. 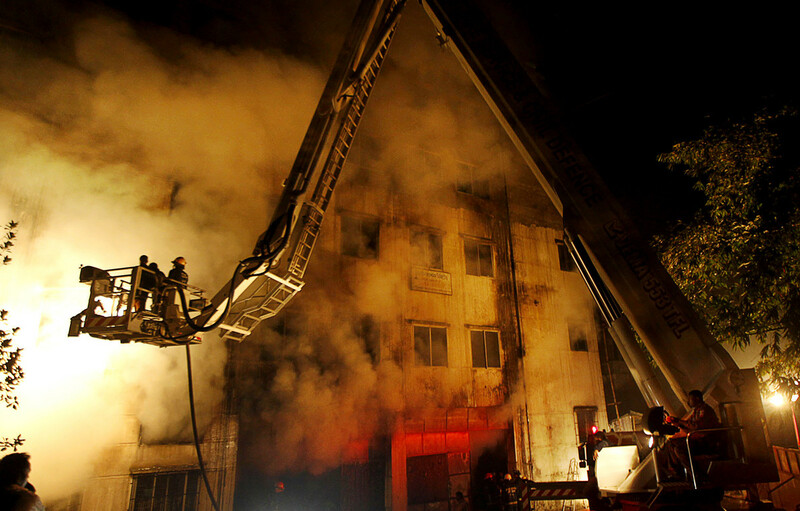 The fire at the nine-story factory started on the ground floor late on Saturday and spread, trapping hundreds of workers. Interior stairways were made impassable by the flames rising from the first floor where the blaze began. The cause of this fire that started on the ground floor is not yet known. The building had no fire escapes. Over 600 of the factory’s 1,500 employees were reported to have been in the factory working overtime when the blaze began. Most of the workers killed were women, including at least nine who jumped to their death from windows. Some workers died of smoke inhalation and many were burned beyond recognition, while many more were taken to the hospital for severe burns and toxic exposure. The Tazreen factory has been reported to have sales of over $35,000,000 per year. The entry-level wage for a garment worker is about $37 per month. Thousands of people are in the streets this week protesting working conditions at Bangladeshi factories which are notoriously poor, with little enforcement of safety laws, and with overcrowding and locked fire doors common. In 2006 a similar fire in Bangladesh killed 84 garment workers who could not escape through blocked fire exits. Over 300 factory workers have died in Bangladesh in the past six year resulting from unsafe working conditions. More than 300 factories near the capital shut for almost a week earlier this year as workers demanded higher wages and better working conditions. Bangladesh, with over 4,500 garment factories, is the second largest exporter of clothing after China, manufacturing clothing for stores like Wal-Mart, J.C. Penny, and Khols. After the blaze was extinguished, charred clothing with labels from Faded Glory, Wal-Mart’s brand of clothing was found in the remains. According to the New York Times, Bangladesh’s garment industry has also attracted rising international and domestic criticism over a poor fire safety record, low wages and policies that restrict labor organizing inside factories. The Clean Clothes Campaign, a European group that opposes sweatshops, said that more than 500 Bangladeshi laborers had died in factory fires since 2006. In 2010, 29 workers died from a fire inside a Bangladeshi factory making clothing for Tommy Hilfiger. Thanks to decades of reform and creation of workplace safety laws, the United States, generally speaking, is one hundred years ahead of countries like Bangladesh concerning workplace accidents and safety. This disaster is nearly a reenactment of one of the United States’ most horrific workplace disasters. On March 25, 1911 in New York City, the Triangle Shirtwaist Factory fire became the deadliest industrial disaster in the history of New York City. Young women, most in their teens, were found dead by locked doors within the factory. The Triangle Shirtwaist Factory doors had been locked from the outside to keep the workers in and union organizers out. At least 146 garment workers died in this fire, some burned so badly that they were unrecognizable. Some workers had died from smoke inhalation; many died from being crushed by other frantic workers trying to escape. Others jumped from 9th and 10th story floors of the building to escape the flames and were instantly killed upon impact; some even impaled on a nearby iron fence that bordered the street by the building before they hit the ground. In November of 1910, just months before this disaster, 20,000 young women had organized a general strike, protesting in the streets to condemn the unsafe working conditions in the dimly lit fire traps in which they had found employment. The union eventually ran out of money, and the thinly clad garment workers who were not even able to afford coats were forced to return to work in order to provide for their daily existence. A Factory Investigating Commission was created by the New York State Legislature to “investigate factory conditions in NYC and other cities and to report remedial measures of legislation to prevent hazard or loss of life among employees through fire, unsanitary conditions, and occupational diseases.” The investigators found more than 200 New York factories were found to have conditions similar to those leading to the Triangle Shirtwaist fire. Today, these conditions still exist in China, Bangladesh, India, and other countries where workers’ rights to safety have been ignored in favor of maximum profits for the companies. These reports helped modernize labor laws, making New York State “one of the most progressive states in terms of labor reform.” New laws mandated better building access and egress, fire proofing, availability of fire extinguishers, installation of alarm systems, automatic sprinklers, better eating and toilet facilities for workers, and limited the number of hours that women and children could work. Eventually, organizations such as OSHA and AFL-CIO were created to represent American workers; much of that representation concerns their safety. Workplace personal injury and wrongful death lawyers are dedicated to ensuring that business owners maintain OSHA’s high standards for workplace safety, and ensure that if they do attempt to skirt compliance, they suffer great punitive damages. Unfortunately, the fear of reprisal is sometimes the only motivator for companies to maintain safety standards for their employees. It has taken over two centuries of legal progress for this to happen. Consider the untold number of injury victims from recent prior decades who received no compensation for their injuries because laws favored business and industry and practically ignored workers safety. Modern-day companies including coal mines and gas drilling sites even now at times have the same tendencies as their predecessors — to take advantage of their work force. Like their predecessors, our modern-day companies don’t want to fairly compensate the people they injure or the families of the people they kill. Just like in earlier times of corporate abuse, little to no compensation will be offered to injury victims who must nurse their own injuries with inadequate financial support. Lawmakers normally respond to public sentiment; this is how our representative system of government works. When enough interested citizens and injury victims voice support for better laws, it is up to the lawmakers to respond. In recent decades there has been steady public support for better laws for injury victims. But, corporations and insurance companies don’t want more restrictive safety requirements — that means more liability exposure. In response, lawmakers have had to choose between helping the corporations make more money and helping injury victims get recoveries from wrongdoers. Lawmakers thus far have not completely caved in to the desires of the corporations and insurance companies, because a majority of people have voiced their outrage over corporate greed and their role in causing an increase in incidents involving serious injuries and deaths. Even so, it takes a constant flow of information to lawmakers about injury victims’ plights, and that’s where trial lawyers and their associations are effective in protecting your rights.